as huggable as can be. But since the day he was born, he has been teaching his mom and dad to expect the unexpected. “It was late November of 2015, and I was pregnant with Emilio,” Monica Rosas recalls. “I felt contractions, so I called my husband (Jesus) to let him know. But baby Emilio didn’t see it that way. He was born just two hours later, in a CFD ambulance that had rushed to the Rosas home in Clearing and then headed to MacNeal Hospital. Emilio had arrived in the world before the ambulance could make it to Berwyn. Months later, the unexpected occurred again, but gradually. She brought it up with the family pediatrician, who told Monica not to worry. But when he was nine months old, he was confirmed with what child development experts call global delay. 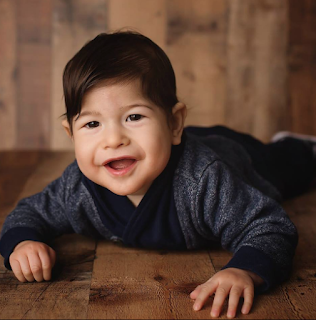 A month later, Emilio started various types of therapy: physical, occupational, speech, aqua, music and more. Monica and Jesus were perplexed and worked to find the correct diagnosis, which they finally received when Emilio was 15 months old. The toddler had a rare genetic disorder known as Pitt-Hopkins Syndrome. PTHS affects a specific gene in chromosome 18, called TCF4. PTHS is characterized by developmental delays, possible breathing problems of episodic hyperventilation and/or breath-holding while awake, recurrent seizures/epilepsy, gastrointestinal issues, lack of speech, and distinctive facial features. Since the gene that causes Pitt Hopkins was only found in 2007, currently there are approximately 550 people in the world diagnosed with this syndrome; however, experts believe there are many more. organized the first-ever Race for Emilio, a 5k walk/run that attracted nearly 300 men, women and children—with all proceeds going to the Pitt Hopkins Research Foundation. 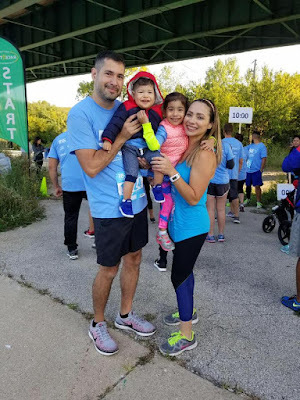 Building upon last year’s success, the Rosas are inviting the community to take part in Race for Emilio again this year. 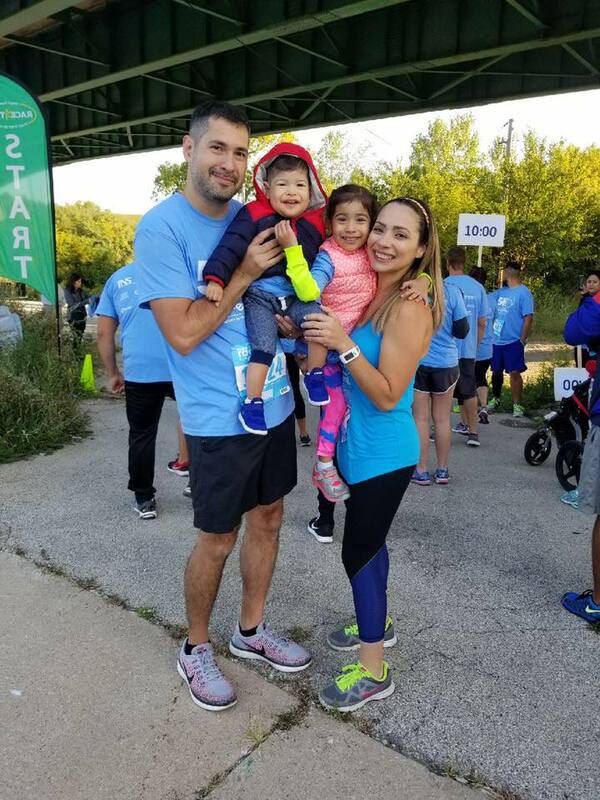 The Rosas family at the 2017 Race for Emilio. Canal Trail—near Archer and Willow Springs Road, in Willow Springs. An “open corral” starts at 8 a.m. The run begins at 8:30, and the walk steps off 15 minutes after that. The celebration should wrap up by 11. Now through race day, registration fees are $40 for runners, $30 for walkers. To register for the event or to simply make a donation, visit raceforemilio.myevent.com. To learn more about Emilio, his journey with Pitt Hopkins and more, visit raceforemilio.strikingly.com. The Rosas are both native Southwest Siders who attended Hubbard High School and later met on a coed volleyball team at Archer Park. They married in 2012 and purchased a home in Clearing. These days, Emilio’s reaching and grasping have become more refined and coordinated. His eye-hand coordination is improving through container play, shape sorters, and puzzle pegs. He can rotate and pivot while lying on his stomach to reach for his toys that are nearby. Emilio can clap and bang two objects together. He has better head control, is able to pull to a sitting and standing position. Emilio is able to sit without support for a longer period of time. Due to Emilio’s low-muscle tone, he was evaluated and provided with a pair of SMO orthotics which help stabilize his ankles for standing and walking. He also has a gait trainer to assist him in a standing position and develop his walking skills. Emilio’s communication is limited but he is able to clap as he is praised, will push away objects he does not want, gives high-fives, hands over his pacifier on demand, attempts to wave bye-bye, and is currently exploring an Alternative and Augmentative Communication (AAC) device that helps expand his communication skills.